National University of Sciences and Technology NUST very well-known and top rated engineering university of Pakistan. NUST was founded in 1991 with mission of providing quality education and invest in research. So far in a very short period of time they are able to earn very good name in world. NUST provides wide range of programs to accommodate students from every field which also includes engineering programs offered to DAE candidates. Due to their high standards their fee structure is also high, but for poor people they have scholarship facilities (Need based Scholarship). Minimum 60% marks are required to become eligible for NUST NET test. NUST NET test is expected to be conduct in Dec 2018. Every year thousands of students apply for NUST NET, all candidates should work very hard to get admission in NUST. Preparing from Pakprep.com is the best way to get admission in NUST. We have more than 15000 solved MCQ’s along with explanation. We also provide past papers for NUST NET, MOCK test will help students to analyze paper situation and manage their time in a better way. Smart analytics will keep record of all your test, so that you can identify your week areas and work more on them. To start your preparation today with Pakprep.com please CLICK HERE. This entry was posted in NUST and tagged Best way to prepare for NUST, Best website to prepare for NET-I, Best website to prepare for NUST, Best website to prepare for NUST NET-I, Download NUST NET Past Paper, Download NUST Past Papers, How much marks I need in NUST NET?, How to Calculate NUST Aggregate, How to prepare for NUST, How to Prepare for NUST NET 2016, How to Prepare for NUST NET 2017, How to prepare for NUST NET-I, How to prepare NUST NET, How to Register for NUST NET Test, How to register how nust net, Important Maths Topics for NUST NET, Important Physics Topics NUST NET, Marks Required in NUST NET?, Mechatronics Engineering eligibility criteria, NET, NET 1, NET 2, NET 3, NET-I explained MCQ’s, NET-I MCQ’s, NET-I MOCK test, NET-I past papers, NET-I solved MCQ’s, NUST, nust 2015, nust 2016, nust 2017, nust admission, nust admission 2017, Nust Admission Test, Nust Admission Test 2015, Nust Admission Test 2015 engineering, Nust Admission Test 2016, Nust Admission Test 2016 engineering, Nust Admission Test 2016 NUST NET 2016 Preparation, Nust Admission Test 2017, Nust Admission Test 2017 engineering, Nust Admission Test 2017 NUST NET 2017 Preparation, NUST Aerospace Engineering eligibility criteria, NUST Aggregate, NUST aggregate 2014, nust Aggregate 2016, nust Aggregate 2017, NUST Bachelor of Industrial Design program, NUST Bachelor of Military Art and Science program, NUST BBA program (Hons. 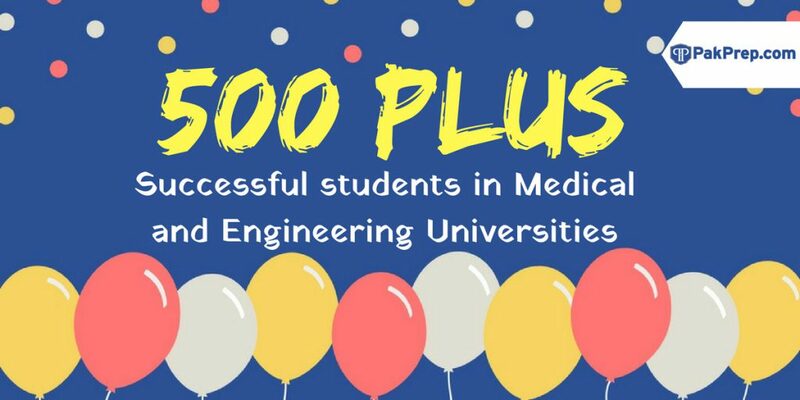 ), NUST BE Aerospace program (Aviation Mechanical), NUST BE Avionics program (Aviation Electrical), NUST BE Chemical program, NUST BE Civil program, NUST BE Computer program, NUST BE Electrical program, NUST BE Environmental program, NUST BE Geo Informatics program, NUST BE Industrial and Manufacturing program, NUST BE Materials program, NUST BE Mechanical program, NUST BE Mechatronics program, NUST BE program (Telecom), NUST BE Software program, NUST Biology MCQs, NUST BS Accounting & Finance program, NUST BS Architecture program, NUST BS Computer Science program, NUST BS Economics program, NUST BS Mass Communication program, NUST BS Mathematics program, NUST BS Physics program, NUST BS Public Administration program, Nust Chemistry MCQs, NUST Civil Engineering eligibility criteria, NUST Computer Science (Islamabad) eligibility criteria, NUST Computer Software Engineering eligibility criteria, NUST DAE admissions, NUST DAE eligibility, NUST DAE eligibility criteria, NUST DAE offered programs, NUST DAE programs, NUST Electrical (Telecom) eligibility criteria, NUST Electrical Engineering eligibility criteria, NUST Eligibility Criteria, nust engineering, NUST Engineering Past Paper, Nust Entrance Test, Nust Entrance Test 2015, Nust Entrance Test 2016, Nust Entrance Test 2017, nust entry test, NUST Entry test 2015 preparation, NUST Entry test 2016 preparation, NUST Entry test 2017 preparation, NUST entry test expected dates, NUST entry test expected dates 2018, nust entry test preparation, NUST Environmental Engineering eligibility criteria, NUST explained MCQ’s, NUST FEE Structure, nust financial aid, NUST Geo Informatics Engineering eligibility criteria, NUST Integration MCQs, Nust Islamabad, NUST Maths MCQs, nust mcqs, NUST Mechanical Engineering eligibility criteria, NUST Merit 2014, nust merit list, NUST merit list 2016, NUST MOCK test, NUST Mock Tests, nust net, NUST NET 1, NUST NET 1Paper Pattern, NUST NET 2, NUST NET 2017, NUST NET 2017 Format, NUST NET 2017 MCQs, NUST NET 2017 Physics MCQs, NUST NET 3, NUST NET 3 Preparation Online, NUST NET 3 Solution, NUST NET Biology MCQs, NUST NET Chemistry MCQs, NUST NET Maths MCQs, NUST NET Online Preparation, NUST NET Online Test Preparation, NUST NET Paper Pattern, NUST NET Past Papers, NUST NET Physics MCQs, NUST NET Practice Test, nust net preparation, NUST NET preparation 2016, NUST NET preparation 2017, NUST NET result, NUST NET-I, NUST NET-I eligibility criteria, NUST NET-I entry test, NUST NET-I expected dates, NUST NET-I explained MCQ’s, NUST NET-I MCQ’s, NUST NET-I MOCK test, NUST NET-I past papers, NUST NET-I solved MCQ’s, NUST offered programs to DAE, Nust past paper, NUST Past Papers, NUST Past Papers Engineering, NUST Past Papers Medical, nust physics, Nust Physics MCQs, Nust Practice MCQs, Nust practice test, nust programs, nust scholarships, NUST Semester FEE, NUST Software Engineering eligibility criteria, NUST Solved MCQs, Nust test, nust undergraduate, nust undergraduate admission, nust undergraduate admissions, nust undergraduate program, nust undergraduate programs, NUST University, online NET-I preparation, online NUST NET-I preparation, online NUST preparation, Sample NET questions, Sample NET-I Chemistry questions, Sample NET-I Math questions, Sample NET-I Physics questions, Sample NUST Chemistry questions, Sample NUST Math questions, Sample NUST NET-I Chemistry questions, Sample NUST NET-I Math questions, Sample NUST NET-I Physics questions, Sample NUST Physics questions, sample NUST questions, Solved NUST MCQs, Solved NUST Past Paper, Where to prepare, Where to prepare for NET-I, Where to prepare for NUST, Where to prepare for NUST NET-I, Where to prepare for NUST NET-I entry test on April 2, 2019 by Pakprep.com Admin. National University of Sciences and Technology NUST is one of the top rated engineering universities of Pakistan and also very well known around the world. NUST NET-1 registrations are open until 18th of December 2018, NUST NET-1 entry test will be conducted on 28th December 2018 on words. Due to quality of education and facilities provided to students NUST fee structure is a bit high as compared to other universities but they also provide many scholarships to their students including need based scholarship. NUST also provide a vast range of Undergraduate Programs for applicants other than engineering. Eligibility criteria to apply for NUST is only 60% in FSc. Competition is very tough at NUST, so applicants must be fully prepared if they want to secure their admission. 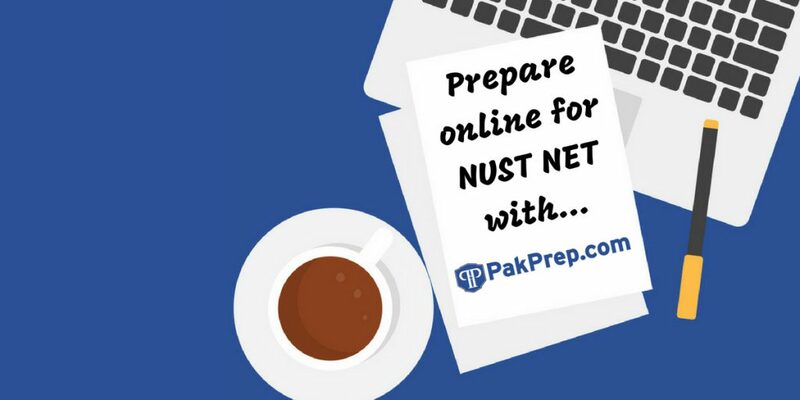 Pakprep.com is well furnished with all material which is supportive for students to prepare for NUST NET entry test. Pakprep.com contains more than 15000 solved MCQ’s along with explanation. We have more than 500 successful students from last year who got admission in different universities after preparing from Pakprep.com. We also provide facility of past papers to our students. We have NUST NET past papers which helps students to understand structure of entry test and difficulty of MCQ’s. Students can also take MOCK test from our website which are prepared and marked according to NUST standards. Smart analytics will help students to identify their weak areas and keep a separate log of all their mistakes. To start your preparation today with Pakprep.com please CLICK HERE. This entry was posted in NUST and tagged Best way to prepare for NUST, Best website to prepare for NET-I, Best website to prepare for NUST, Best website to prepare for NUST NET-I, Download NUST NET Past Paper, Download NUST Past Papers, How much marks I need in NUST NET?, How to Calculate NUST Aggregate, How to prepare for NUST, How to Prepare for NUST NET 2016, How to Prepare for NUST NET 2017, How to prepare for NUST NET-I, How to prepare NUST NET, How to Register for NUST NET Test, How to register how nust net, Important Maths Topics for NUST NET, Important Physics Topics NUST NET, Marks Required in NUST NET?, Mechatronics Engineering closing merit, Mechatronics Engineering eligibility criteria, NET, NET 1, NET 2, NET 3, NET-I explained MCQ’s, NET-I MCQ’s, NET-I MOCK test, NET-I past papers, NET-I solved MCQ’s, NUST, nust 2015, nust 2016, nust 2017, nust admission, nust admission 2017, NUST admission fee, NUST admission fee for international students, NUST admission fee for national students, Nust Admission Test, Nust Admission Test 2015, Nust Admission Test 2015 engineering, Nust Admission Test 2016, Nust Admission Test 2016 engineering, Nust Admission Test 2016 NUST NET 2016 Preparation, Nust Admission Test 2017, Nust Admission Test 2017 engineering, Nust Admission Test 2017 NUST NET 2017 Preparation, NUST Aerospace Engineering closing merit, NUST Aerospace Engineering eligibility criteria, NUST Aggregate, NUST aggregate 2014, nust Aggregate 2016, nust Aggregate 2017, NUST Avionics Engineering (Risalpur) closing merit, NUST Bachelor of Industrial Design NUST BE Environmental program, NUST Bachelor of Industrial Design program, NUST Bachelor of Military Art and Science, NUST Bachelor of Military Art and Science program, NUST BBA (Hons. ), NUST BBA program (Hons. ), NUST BE (Telecom), NUST BE Aerospace (Aviation Mechanical), NUST BE Aerospace program (Aviation Mechanical), NUST BE Avionics (Aviation Electrical), NUST BE Avionics program (Aviation Electrical), NUST BE Chemical, NUST BE Chemical program, NUST BE Civil, NUST BE Civil program, NUST BE Computer, NUST BE Computer program, NUST BE Electrical, NUST BE Electrical program, NUST BE Geo Informatics, NUST BE Geo Informatics program, NUST BE Industrial and Manufacturing, NUST BE Industrial and Manufacturing program, NUST BE Materials, NUST BE Materials program, NUST BE Mechanical, NUST BE Mechanical program, NUST BE Mechatronics, NUST BE Mechatronics program, NUST BE program (Telecom), NUST BE Software, NUST BE Software program, NUST Biology MCQs, NUST BS Accounting & Finance, NUST BS Accounting & Finance program, NUST BS Architecture, NUST BS Architecture program, NUST BS Computer Science, NUST BS Computer Science program, NUST BS Economics, NUST BS Economics program, NUST BS Mass Communication, NUST BS Mass Communication program, NUST BS Mathematics, NUST BS Mathematics program, NUST BS Physics, NUST BS Physics program, NUST BS Public Administration, NUST BS Public Administration program, Nust Chemistry MCQs, NUST Civil Engineering closing merit, NUST Civil Engineering eligibility criteria, NUST closing merit, NUST closing merit 2017, NUST Computer Science (Islamabad) closing merit, NUST Computer Science (Islamabad) eligibility criteria, NUST Computer Software Engineering closing merit, NUST Computer Software Engineering eligibility criteria, NUST DAE admissions, NUST DAE eligibility, NUST DAE eligibility criteria, NUST DAE offered programs, NUST DAE programs, NUST Electrical (Telecom) closing merit, NUST Electrical (Telecom) eligibility criteria, NUST Electrical Engineering closing merit, NUST Electrical Engineering eligibility criteria, NUST Eligibility Criteria, nust engineering, NUST Engineering Past Paper, Nust Entrance Test, Nust Entrance Test 2015, Nust Entrance Test 2016, Nust Entrance Test 2017, nust entry test, NUST Entry test 2015 preparation, NUST Entry test 2016 preparation, NUST Entry test 2017 preparation, NUST entry test expected dates, NUST entry test expected dates 2018, nust entry test preparation, NUST Environmental Engineering closing merit, NUST Environmental Engineering eligibility criteria, NUST Expenses, NUST explained MCQ’s, NUST fee, NUST fee for international students, NUST fee for national students, NUST FEE Structure, nust financial aid, NUST Geo Informatics Engineering closing merit, NUST Geo Informatics Engineering eligibility criteria, NUST Integration MCQs, Nust Islamabad, NUST Maths MCQs, nust mcqs, NUST Mechanical Engineering closing merit, NUST Mechanical Engineering eligibility criteria, NUST Merit 2014, nust merit list, NUST merit list 2016, NUST merit list 2017, NUST MOCK test, NUST Mock Tests, nust net, NUST NET 1, NUST NET 1Paper Pattern, NUST NET 2, NUST NET 2017, NUST NET 2017 Format, NUST NET 2017 MCQs, NUST NET 2017 Physics MCQs, NUST NET 3, NUST NET 3 Preparation Online, NUST NET 3 Solution, NUST NET Biology MCQs, NUST NET Chemistry MCQs, NUST NET Maths MCQs, NUST NET Online Preparation, NUST NET Online Test Preparation, NUST NET Paper Pattern, NUST NET Past Papers, NUST NET Physics MCQs, NUST NET Practice Test, nust net preparation, NUST NET preparation 2016, NUST NET preparation 2017, NUST NET result, NUST NET-I, NUST NET-I eligibility criteria, NUST NET-I entry test, NUST NET-I expected dates, NUST NET-I explained MCQ’s, NUST NET-I MCQ’s, NUST NET-I MOCK test, NUST NET-I past papers, NUST NET-I solved MCQ’s, NUST offered programs to DAE, Nust past paper, NUST Past Papers, NUST Past Papers Engineering, NUST Past Papers Medical, nust physics, Nust Physics MCQs, Nust Practice MCQs, Nust practice test, nust programs, nust scholarships, NUST Semester FEE, NUST Software Engineering closing merit, NUST Software Engineering eligibility criteria, NUST Solved MCQs, Nust test, NUST tuition fee, NUST tuition fee for international students, nust undergraduate, nust undergraduate admission, nust undergraduate admissions, nust undergraduate program, nust undergraduate programs, NUST University, NUST yearly expenses, online NET-I preparation, online NUST NET-I preparation, online NUST preparation, Sample NET questions, Sample NET-I Chemistry questions, Sample NET-I Math questions, Sample NET-I Physics questions, Sample NUST Chemistry questions, Sample NUST Math questions, Sample NUST NET-I Chemistry questions, Sample NUST NET-I Math questions, Sample NUST NET-I Physics questions, Sample NUST Physics questions, sample NUST questions, Solved NUST MCQs, Solved NUST Past Paper NUST BE Environmental, Where to prepare, Where to prepare for NET-I, Where to prepare for NUST, Where to prepare for NUST NET-I, Where to prepare for NUST NET-I entry test on December 19, 2018 by Pakprep.com Admin. National University of Sciences and Technology NUST is among top engineering universities of Pakistan. NUST was established with a goal of providing quality education to its students and to create better carrier opportunities for them so that they can succeed in their lives. National University of Sciences and Technology NUST was founded in 1991, their main campus is in Islamabad. NUST NET entry test consist of different subjects according to category. NUST NET-1 registration is open now from 18 Nov – 18 Dec 2018. Due to quality of education their fee structure is also high, but to facilitate poor students they provide need based scholarships. NUST provides a vast range of undergraduate programs for their students including Business Management, students from A level background can also apply for different programs. Their eligibility criteria is not very high only 60% marks are required to apply for NUST. NUST entry test is very difficult and competition is also very high because students from all over Pakistan apply for NUST NET. Pakprep.com is well furnished with all material which is supportive for students to prepare for NUST NET entry test. Pakprep.com contains more than 15000 solved MCQ’s along with explanation prepared by experienced teachers. We have more than 500 successful students from last year who got admission in different universities after preparing from Pakprep.com. We also provide facility of past papers to our students. We have NUST NET past papers which helps students to understand structure of entry test and difficulty of MCQ’s. Students can also take MOCK test from our website which are prepared and marked according to NUST standards. Smart analytics will help students to identify their weak areas and keep a separate log of all their mistakes. To start your preparation today with Pakprep.com please CLICK HERE. This entry was posted in NUST and tagged Best way to prepare for NUST, Best website to prepare for NET-I, Best website to prepare for NUST, Best website to prepare for NUST NET-I, Download NUST NET Past Paper, Download NUST Past Papers, How much marks I need in NUST NET?, How to Calculate NUST Aggregate, How to prepare for NUST, How to Prepare for NUST NET 2016, How to Prepare for NUST NET 2017, How to prepare for NUST NET-I, How to prepare NUST NET, How to Register for NUST NET Test, How to register how nust net, Important Maths Topics for NUST NET, Important Physics Topics NUST NET, Marks Required in NUST NET?, Mechatronics Engineering eligibility criteria, NET, NET 1, NET 2, NET 3, NET-I explained MCQ’s, NET-I MCQ’s, NET-I MOCK test, NET-I past papers, NET-I solved MCQ’s, NUST, nust 2015, nust 2016, nust 2017, nust admission, nust admission 2017, Nust Admission Test, Nust Admission Test 2015, Nust Admission Test 2015 engineering, Nust Admission Test 2016, Nust Admission Test 2016 engineering, Nust Admission Test 2016 NUST NET 2016 Preparation, Nust Admission Test 2017, Nust Admission Test 2017 engineering, Nust Admission Test 2017 NUST NET 2017 Preparation, NUST Aerospace Engineering eligibility criteria, NUST Aggregate, NUST aggregate 2014, nust Aggregate 2016, nust Aggregate 2017, NUST Biology MCQs, Nust Chemistry MCQs, NUST Civil Engineering eligibility criteria, NUST Computer Science (Islamabad) eligibility criteria, NUST Computer Software Engineering eligibility criteria, NUST Electrical (Telecom) eligibility criteria, NUST Electrical Engineering eligibility criteria, NUST Eligibility Criteria, nust engineering, NUST Engineering Past Paper, Nust Entrance Test, Nust Entrance Test 2015, Nust Entrance Test 2016, Nust Entrance Test 2017, nust entry test, NUST Entry test 2015 preparation, NUST Entry test 2016 preparation, NUST Entry test 2017 preparation, NUST entry test expected dates, NUST entry test expected dates 2018, nust entry test preparation, NUST Environmental Engineering eligibility criteria, NUST explained MCQ’s, NUST FEE Structure, nust financial aid, NUST Geo Informatics Engineering eligibility criteria, NUST Integration MCQs, Nust Islamabad, NUST Maths MCQs, nust mcqs, NUST Mechanical Engineering eligibility criteria, NUST Merit 2014, nust merit list, NUST merit list 2016, NUST MOCK test, NUST Mock Tests, nust net, NUST NET 1, NUST NET 1Paper Pattern, NUST NET 2, NUST NET 2017, NUST NET 2017 Format, NUST NET 2017 MCQs, NUST NET 2017 Physics MCQs, NUST NET 3, NUST NET 3 Preparation Online, NUST NET 3 Solution, NUST NET Biology MCQs, NUST NET Chemistry MCQs, NUST NET Maths MCQs, NUST NET Online Preparation, NUST NET Online Test Preparation, NUST NET Paper Pattern, NUST NET Past Papers, NUST NET Physics MCQs, NUST NET Practice Test, nust net preparation, NUST NET preparation 2016, NUST NET preparation 2017, NUST NET result, NUST NET-I, NUST NET-I eligibility criteria, NUST NET-I entry test, NUST NET-I expected dates, NUST NET-I explained MCQ’s, NUST NET-I MCQ’s, NUST NET-I MOCK test, NUST NET-I past papers, NUST NET-I solved MCQ’s, Nust past paper, NUST Past Papers, NUST Past Papers Engineering, NUST Past Papers Medical, nust physics, Nust Physics MCQs, Nust Practice MCQs, Nust practice test, nust programs, nust scholarships, NUST Semester FEE, NUST Software Engineering eligibility criteria, NUST Solved MCQs, Nust test, nust undergraduate, nust undergraduate admission, nust undergraduate admissions, nust undergraduate program, nust undergraduate programs, NUST University, online NET-I preparation, online NUST NET-I preparation, online NUST preparation, Sample NET questions, Sample NET-I Chemistry questions, Sample NET-I Math questions, Sample NET-I Physics questions, Sample NUST Chemistry questions, Sample NUST Math questions, Sample NUST NET-I Chemistry questions, Sample NUST NET-I Math questions, Sample NUST NET-I Physics questions, Sample NUST Physics questions, sample NUST questions, Solved NUST MCQs, Solved NUST Past Paper, Where to prepare, Where to prepare for NET-I, Where to prepare for NUST, Where to prepare for NUST NET-I, Where to prepare for NUST NET-I entry test on December 18, 2018 by Pakprep.com Admin. National University of Sciences and Technology (NUST) was founded in 1991 with the aim of providing quality education to the students. In a very short period of time they earned their name worldwide. It is one of the top rated engineering university of Pakistan. Nust offers many programs to satisfy students from every field. Due to their quality education, the fee structure is also high but for the students who can not afford the fee, NUST have the facility of need based scholarship. NUST NET test is expected to be conducted in Dec 2018. Every year thousands of candidates apply for NUST NET, but only those students get selected who have clear concepts. This entry was posted in NUST and tagged Best way to prepare for NUST, Best website to prepare for NET-I, Best website to prepare for NUST, Best website to prepare for NUST NET-I, Bio Sciences, Download NUST NET Past Paper, Download NUST Past Papers, How much marks I need in NUST NET?, How to Calculate NUST Aggregate, How to prepare for NUST, How to Prepare for NUST NET 2016, How to Prepare for NUST NET 2017, How to prepare for NUST NET-I, How to prepare NUST NET, How to Register for NUST NET Test, How to register how nust net, Important Maths Topics for NUST NET, Important Physics Topics NUST NET, Marks Required in NUST NET?, NET, NET 1, NET 2, NET 3, NET-I explained MCQ’s, NET-I MCQ’s, NET-I MOCK test, NET-I past papers, NET-I solved MCQ’s, NUST, nust 2015, nust 2016, nust 2017, nust admission, nust admission 2017, Nust Admission Test, Nust Admission Test 2015, Nust Admission Test 2015 engineering, Nust Admission Test 2016, Nust Admission Test 2016 engineering, Nust Admission Test 2016 NUST NET 2016 Preparation, Nust Admission Test 2017, Nust Admission Test 2017 engineering, Nust Admission Test 2017 NUST NET 2017 Preparation, NUST Aggregate, NUST aggregate 2014, nust Aggregate 2016, nust Aggregate 2017, NUST Biology MCQs, Nust Chemistry MCQs, NUST Eligibility Criteria, nust engineering, NUST Engineering Past Paper, Nust Entrance Test, Nust Entrance Test 2015, Nust Entrance Test 2016, Nust Entrance Test 2017, nust entry test, NUST Entry test 2015 preparation, NUST Entry test 2016 preparation, NUST Entry test 2017 preparation, NUST entry test expected dates, NUST entry test expected dates 2018, nust entry test preparation, NUST explained MCQ’s, NUST FEE Structure, nust financial aid, NUST Integration MCQs, Nust Islamabad, NUST Maths MCQs, nust mcqs, NUST Merit 2014, nust merit list, NUST merit list 2016, NUST MOCK test, NUST Mock Tests, nust net, NUST NET 1, NUST NET 1Paper Pattern, NUST NET 2, NUST NET 2017, NUST NET 2017 Format, NUST NET 2017 MCQs, NUST NET 2017 Physics MCQs, NUST NET 3, NUST NET 3 Preparation Online, NUST NET 3 Solution, NUST NET Biology MCQs, NUST NET Chemistry MCQs, NUST NET Maths MCQs, NUST NET Online Preparation, NUST NET Online Test Preparation, NUST NET Paper Pattern, NUST NET Past Papers, NUST NET Physics MCQs, NUST NET Practice Test, nust net preparation, NUST NET preparation 2016, NUST NET preparation 2017, NUST NET result, NUST NET-I, NUST NET-I eligibility criteria, NUST NET-I entry test, NUST NET-I expected dates, NUST NET-I explained MCQ’s, NUST NET-I MCQ’s, NUST NET-I MOCK test, NUST NET-I past papers, NUST NET-I solved MCQ’s, Nust past paper, NUST Past Papers, NUST Past Papers Engineering, NUST Past Papers Medical, nust physics, Nust Physics MCQs, Nust Practice MCQs, Nust practice test, nust programs, nust scholarships, NUST Semester FEE, NUST Solved MCQs, Nust test, nust undergraduate, nust undergraduate admission, nust undergraduate admissions, nust undergraduate program, nust undergraduate programs, NUST University, online NET-I preparation, online NUST NET-I preparation, online NUST preparation, Sample NET questions, Sample NET-I Chemistry questions, Sample NET-I Math questions, Sample NET-I Physics questions, Sample NUST Chemistry questions, Sample NUST Math questions, Sample NUST NET-I Chemistry questions, Sample NUST NET-I Math questions, Sample NUST NET-I Physics questions, Sample NUST Physics questions, sample NUST questions, Solved NUST MCQs, Solved NUST Past Paper, Where to prepare, Where to prepare for NET-I, Where to prepare for NUST, Where to prepare for NUST NET-I, Where to prepare for NUST NET-I entry test on December 3, 2018 by Pakprep.com Admin. This entry was posted in NUST and tagged Best way to prepare for NUST, Best website to prepare for NET-I, Best website to prepare for NUST, Best website to prepare for NUST NET-I, Download NUST NET Past Paper, Download NUST Past Papers, How much marks I need in NUST NET?, How to Calculate NUST Aggregate, How to prepare for NUST, How to Prepare for NUST NET 2016, How to Prepare for NUST NET 2017, How to prepare for NUST NET-I, How to prepare NUST NET, How to Register for NUST NET Test, How to register how nust net, Important Maths Topics for NUST NET, Important Physics Topics NUST NET, Marks Required in NUST NET?, NET, NET 1, NET 2, NET 3, NET-I explained MCQ’s, NET-I MCQ’s, NET-I MOCK test, NET-I past papers, NET-I solved MCQ’s, NUST, nust 2015, nust 2016, nust 2017, nust admission, nust admission 2017, Nust Admission Test, Nust Admission Test 2015, Nust Admission Test 2015 engineering, Nust Admission Test 2016, Nust Admission Test 2016 engineering, Nust Admission Test 2016 NUST NET 2016 Preparation, Nust Admission Test 2017, Nust Admission Test 2017 engineering, Nust Admission Test 2017 NUST NET 2017 Preparation, NUST Aggregate, NUST aggregate 2014, nust Aggregate 2016, nust Aggregate 2017, NUST Biology MCQs, Nust Chemistry MCQs, NUST Eligibility Criteria, nust engineering, NUST Engineering Past Paper, Nust Entrance Test, Nust Entrance Test 2015, Nust Entrance Test 2016, Nust Entrance Test 2017, nust entry test, NUST Entry test 2015 preparation, NUST Entry test 2016 preparation, NUST Entry test 2017 preparation, NUST entry test expected dates, NUST entry test expected dates 2018, nust entry test preparation, NUST explained MCQ’s, NUST FEE Structure, nust financial aid, NUST Integration MCQs, Nust Islamabad, NUST Maths MCQs, nust mcqs, NUST Merit 2014, nust merit list, NUST merit list 2016, NUST MOCK test, NUST Mock Tests, nust net, NUST NET 1, NUST NET 1Paper Pattern, NUST NET 2, NUST NET 2017, NUST NET 2017 Format, NUST NET 2017 MCQs, NUST NET 2017 Physics MCQs, NUST NET 3, NUST NET 3 Preparation Online, NUST NET 3 Solution, NUST NET Biology MCQs, NUST NET Chemistry MCQs, NUST NET Maths MCQs, NUST NET Online Preparation, NUST NET Online Test Preparation, NUST NET Paper Pattern, NUST NET Past Papers, NUST NET Physics MCQs, NUST NET Practice Test, nust net preparation, NUST NET preparation 2016, NUST NET preparation 2017, NUST NET result, NUST NET-I, NUST NET-I eligibility criteria, NUST NET-I entry test, NUST NET-I expected dates, NUST NET-I explained MCQ’s, NUST NET-I MCQ’s, NUST NET-I MOCK test, NUST NET-I past papers, NUST NET-I solved MCQ’s, Nust past paper, NUST Past Papers, NUST Past Papers Engineering, NUST Past Papers Medical, nust physics, Nust Physics MCQs, Nust Practice MCQs, Nust practice test, nust programs, nust scholarships, NUST Semester FEE, NUST Solved MCQs, Nust test, nust undergraduate, nust undergraduate admission, nust undergraduate admissions, nust undergraduate program, nust undergraduate programs, NUST University, online NET-I preparation, online NUST NET-I preparation, online NUST preparation, Sample NET questions, Sample NET-I Chemistry questions, Sample NET-I Math questions, Sample NET-I Physics questions, Sample NUST Chemistry questions, Sample NUST Math questions, Sample NUST NET-I Chemistry questions, Sample NUST NET-I Math questions, Sample NUST NET-I Physics questions, Sample NUST Physics questions, sample NUST questions, Solved NUST MCQs, Solved NUST Past Paper, Where to prepare, Where to prepare for NET-I, Where to prepare for NUST, Where to prepare for NUST NET-I, Where to prepare for NUST NET-I entry test on November 30, 2018 by Pakprep.com Admin. National University of Sciences and Technology (NUST) is ranked among top engineering universities of Pakistan. NUST was established in 1991, they have many campuses in different cities but their main campus is in Islamabad. NUST was established with a goal of providing quality education to its students and to create better carrier opportunities for them so that they can succeed in their lives. Nust mainly focus on quality education thats why their fee is quite high but they facilitate poor and needy students through need base scholarship. NUST has earned his status in a very short period of time through their dedication and hard work. This entry was posted in NUST and tagged Best way to prepare for NUST, Best website to prepare for NET-I, Best website to prepare for NUST, Best website to prepare for NUST NET-I, Download NUST NET Past Paper, Download NUST Past Papers, How much marks I need in NUST NET?, How to Calculate NUST Aggregate, How to prepare for NUST, How to Prepare for NUST NET 2016, How to Prepare for NUST NET 2017, How to prepare for NUST NET-I, How to prepare NUST NET, How to Register for NUST NET Test, How to register how nust net, Important Maths Topics for NUST NET, Important Physics Topics NUST NET, Marks Required in NUST NET?, NET, NET 1, NET 2, NET 3, NET-I explained MCQ’s, NET-I MCQ’s, NET-I MOCK test, NET-I past papers, NET-I solved MCQ’s, NUST, nust 2015, nust 2016, nust 2017, nust admission, nust admission 2017, Nust Admission Test, Nust Admission Test 2015, Nust Admission Test 2015 engineering, Nust Admission Test 2016, Nust Admission Test 2016 engineering, Nust Admission Test 2016 NUST NET 2016 Preparation, Nust Admission Test 2017, Nust Admission Test 2017 engineering, Nust Admission Test 2017 NUST NET 2017 Preparation, NUST Aggregate, NUST aggregate 2014, nust Aggregate 2016, nust Aggregate 2017, NUST Biology MCQs, Nust Chemistry MCQs, NUST Eligibility Criteria, nust engineering, NUST Engineering Past Paper, Nust Entrance Test, Nust Entrance Test 2015, Nust Entrance Test 2016, Nust Entrance Test 2017, nust entry test, NUST Entry test 2015 preparation, NUST Entry test 2016 preparation, NUST Entry test 2017 preparation, NUST entry test expected dates, NUST entry test expected dates 2018, nust entry test preparation, NUST explained MCQ’s, NUST FEE Structure, nust financial aid, NUST Integration MCQs, Nust Islamabad, NUST Maths MCQs, nust mcqs, NUST Merit 2014, nust merit list, NUST merit list 2016, NUST MOCK test, NUST Mock Tests, nust net, NUST NET 1, NUST NET 1Paper Pattern, NUST NET 2, NUST NET 2017, NUST NET 2017 Format, NUST NET 2017 MCQs, NUST NET 2017 Physics MCQs, NUST NET 3, NUST NET 3 Preparation Online, NUST NET 3 Solution, NUST NET Biology MCQs, NUST NET Chemistry MCQs, NUST NET Maths MCQs, NUST NET Online Preparation, NUST NET Online Test Preparation, NUST NET Paper Pattern, NUST NET Past Papers, NUST NET Physics MCQs, NUST NET Practice Test, nust net preparation, NUST NET preparation 2016, NUST NET preparation 2017, NUST NET result, NUST NET-I, NUST NET-I eligibility criteria, NUST NET-I entry test, NUST NET-I expected dates, NUST NET-I explained MCQ’s, NUST NET-I MCQ’s, NUST NET-I MOCK test, NUST NET-I past papers, NUST NET-I solved MCQ’s, Nust past paper, NUST Past Papers, NUST Past Papers Engineering, NUST Past Papers Medical, nust physics, Nust Physics MCQs, Nust Practice MCQs, Nust practice test, nust programs, nust scholarships, NUST Semester FEE, NUST Solved MCQs, Nust test, nust undergraduate, nust undergraduate admission, nust undergraduate admissions, nust undergraduate program, nust undergraduate programs, NUST University, online NET-I preparation, online NUST NET-I preparation, online NUST preparation, Sample NET questions, Sample NET-I Chemistry questions, Sample NET-I Math questions, Sample NET-I Physics questions, Sample NUST Chemistry questions, Sample NUST Math questions, Sample NUST NET-I Chemistry questions, Sample NUST NET-I Math questions, Sample NUST NET-I Physics questions, Sample NUST Physics questions, sample NUST questions, Solved NUST MCQs, Solved NUST Past Paper, Where to prepare, Where to prepare for NET-I, Where to prepare for NUST, Where to prepare for NUST NET-I, Where to prepare for NUST NET-I entry test on November 28, 2018 by Pakprep.com Admin. National University of Sciences and technology NUST is very well known engineering university of Pakistan. NUST offers a wide range of programs to their students in many different fields. Their main motive is to provide quality education to their students, because of that their fee is also high as compared to other universities but they also provide need based scholarships to their students. NUST NET entry test is considered to be one of the toughest test of Pakistan, students have to give their 100% in order to secure their admission. NUST NET admissions are open till 15th December 2018 and entry test will start from 28th December 2018. 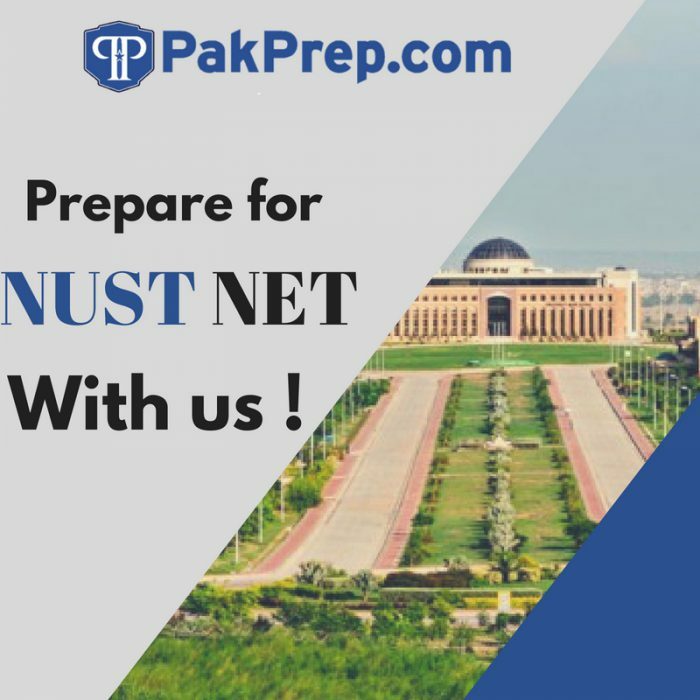 Pakprep.com is fully equipped with all relevant material needed for the preparation of NUST NET or any other engineering test. We have more than 15000 solved MCQ’s along with their explanation. We also provide past papers to our students which helps them in understanding format in a better way. MOCK test and smart analytics help our students to identify their weak areas and mistakes so that they can focus more on them. To start your preparation today for NUST NET please CLICK HERE. This entry was posted in NUST and tagged Best way to prepare for NUST, Best website to prepare for NET-I, Best website to prepare for NUST, Best website to prepare for NUST NET-I, Download NUST NET Past Paper, Download NUST Past Papers, How much marks I need in NUST NET?, How to Calculate NUST Aggregate, How to prepare for NUST, How to Prepare for NUST NET 2016, How to Prepare for NUST NET 2017, How to prepare for NUST NET-I, How to prepare NUST NET, How to Register for NUST NET Test, How to register how nust net, Important Maths Topics for NUST NET, Important Physics Topics NUST NET, Marks Required in NUST NET?, NET, NET 1, NET 2, NET 3, NET-I explained MCQ’s, NET-I MCQ’s, NET-I MOCK test, NET-I past papers, NET-I solved MCQ’s, NUST, nust 2015, nust 2016, nust 2017, nust admission, nust admission 2017, Nust Admission Test, Nust Admission Test 2015, Nust Admission Test 2015 engineering, Nust Admission Test 2016, Nust Admission Test 2016 engineering, Nust Admission Test 2016 NUST NET 2016 Preparation, Nust Admission Test 2017, Nust Admission Test 2017 engineering, Nust Admission Test 2017 NUST NET 2017 Preparation, NUST Aggregate, NUST aggregate 2014, nust Aggregate 2016, nust Aggregate 2017, NUST Biology MCQs, Nust Chemistry MCQs, NUST Eligibility Criteria, nust engineering, NUST Engineering Past Paper, Nust Entrance Test, Nust Entrance Test 2015, Nust Entrance Test 2016, Nust Entrance Test 2017, nust entry test, NUST Entry test 2015 preparation, NUST Entry test 2016 preparation, NUST Entry test 2017 preparation, NUST entry test expected dates, NUST entry test expected dates 2018, nust entry test preparation, NUST explained MCQ’s, NUST FEE Structure, nust financial aid, NUST Integration MCQs, Nust Islamabad, NUST Maths MCQs, nust mcqs, NUST Merit 2014, nust merit list, NUST merit list 2016, NUST MOCK test, NUST Mock Tests, nust net, NUST NET 1, NUST NET 1Paper Pattern, NUST NET 2, NUST NET 2017, NUST NET 2017 Format, NUST NET 2017 MCQs, NUST NET 2017 Physics MCQs, NUST NET 3, NUST NET 3 Preparation Online, NUST NET 3 Solution, NUST NET Biology MCQs, NUST NET Chemistry MCQs, NUST NET Maths MCQs, NUST NET Online Preparation, NUST NET Online Test Preparation, NUST NET Paper Pattern, NUST NET Past Papers, NUST NET Physics MCQs, NUST NET Practice Test, nust net preparation, NUST NET preparation 2016, NUST NET preparation 2017, NUST NET result, NUST NET-I, NUST NET-I eligibility criteria, NUST NET-I entry test, NUST NET-I expected dates, NUST NET-I explained MCQ’s, NUST NET-I MCQ’s, NUST NET-I MOCK test, NUST NET-I past papers, NUST NET-I solved MCQ’s, Nust past paper, NUST Past Papers, NUST Past Papers Engineering, NUST Past Papers Medical, nust physics, Nust Physics MCQs, Nust Practice MCQs, Nust practice test, nust programs, nust scholarships, NUST Semester FEE, NUST Solved MCQs, Nust test, nust undergraduate, nust undergraduate admission, nust undergraduate admissions, nust undergraduate program, nust undergraduate programs, NUST University, online NET-I preparation, online NUST NET-I preparation, online NUST preparation, Sample NET questions, Sample NET-I Chemistry questions, Sample NET-I Math questions, Sample NET-I Physics questions, Sample NUST Chemistry questions, Sample NUST Math questions, Sample NUST NET-I Chemistry questions, Sample NUST NET-I Math questions, Sample NUST NET-I Physics questions, Sample NUST Physics questions, sample NUST questions, Solved NUST MCQs, Solved NUST Past Paper, Where to prepare, Where to prepare for NET-I, Where to prepare for NUST, Where to prepare for NUST NET-I, Where to prepare for NUST NET-I entry test on November 27, 2018 by Pakprep.com Admin. This entry was posted in NUST and tagged Best way to prepare for NUST, Best website to prepare for NET-I, Best website to prepare for NUST, Best website to prepare for NUST NET-I, Download NUST NET Past Paper, Download NUST Past Papers, How much marks I need in NUST NET?, How to Calculate NUST Aggregate, How to prepare for NUST, How to Prepare for NUST NET 2016, How to Prepare for NUST NET 2017, How to prepare for NUST NET-I, How to prepare NUST NET, How to Register for NUST NET Test, How to register how nust net, Important Maths Topics for NUST NET, Important Physics Topics NUST NET, Marks Required in NUST NET?, Mechatronics Engineering eligibility criteria, NET, NET 1, NET 2, NET 3, NET-I explained MCQ’s, NET-I MCQ’s, NET-I MOCK test, NET-I past papers, NET-I solved MCQ’s, NUST, nust 2015, nust 2016, nust 2017, nust admission, nust admission 2017, Nust Admission Test, Nust Admission Test 2015, Nust Admission Test 2015 engineering, Nust Admission Test 2016, Nust Admission Test 2016 engineering, Nust Admission Test 2016 NUST NET 2016 Preparation, Nust Admission Test 2017, Nust Admission Test 2017 engineering, Nust Admission Test 2017 NUST NET 2017 Preparation, NUST Aerospace Engineering eligibility criteria, NUST Aggregate, NUST aggregate 2014, nust Aggregate 2016, nust Aggregate 2017, NUST Biology MCQs, Nust Chemistry MCQs, NUST Civil Engineering eligibility criteria, NUST Computer Science (Islamabad) eligibility criteria, NUST Computer Software Engineering eligibility criteria, NUST Electrical (Telecom) eligibility criteria, NUST Electrical Engineering eligibility criteria, NUST Eligibility Criteria, nust engineering, NUST Engineering Past Paper, Nust Entrance Test, Nust Entrance Test 2015, Nust Entrance Test 2016, Nust Entrance Test 2017, nust entry test, NUST Entry test 2015 preparation, NUST Entry test 2016 preparation, NUST Entry test 2017 preparation, NUST entry test expected dates, NUST entry test expected dates 2018, nust entry test preparation, NUST Environmental Engineering eligibility criteria, NUST explained MCQ’s, NUST FEE Structure, nust financial aid, NUST Geo Informatics Engineering eligibility criteria, NUST Integration MCQs, Nust Islamabad, NUST Maths MCQs, nust mcqs, NUST Mechanical Engineering eligibility criteria, NUST Merit 2014, nust merit list, NUST merit list 2016, NUST MOCK test, NUST Mock Tests, nust net, NUST NET 1, NUST NET 1Paper Pattern, NUST NET 2, NUST NET 2017, NUST NET 2017 Format, NUST NET 2017 MCQs, NUST NET 2017 Physics MCQs, NUST NET 3, NUST NET 3 Preparation Online, NUST NET 3 Solution, NUST NET Biology MCQs, NUST NET Chemistry MCQs, NUST NET Maths MCQs, NUST NET Online Preparation, NUST NET Online Test Preparation, NUST NET Paper Pattern, NUST NET Past Papers, NUST NET Physics MCQs, NUST NET Practice Test, nust net preparation, NUST NET preparation 2016, NUST NET preparation 2017, NUST NET result, NUST NET-I, NUST NET-I eligibility criteria, NUST NET-I entry test, NUST NET-I expected dates, NUST NET-I explained MCQ’s, NUST NET-I MCQ’s, NUST NET-I MOCK test, NUST NET-I past papers, NUST NET-I solved MCQ’s, Nust past paper, NUST Past Papers, NUST Past Papers Engineering, NUST Past Papers Medical, nust physics, Nust Physics MCQs, Nust Practice MCQs, Nust practice test, nust programs, nust scholarships, NUST Semester FEE, NUST Software Engineering eligibility criteria, NUST Solved MCQs, Nust test, nust undergraduate, nust undergraduate admission, nust undergraduate admissions, nust undergraduate program, nust undergraduate programs, NUST University, online NET-I preparation, online NUST NET-I preparation, online NUST preparation, Sample NET questions, Sample NET-I Chemistry questions, Sample NET-I Math questions, Sample NET-I Physics questions, Sample NUST Chemistry questions, Sample NUST Math questions, Sample NUST NET-I Chemistry questions, Sample NUST NET-I Math questions, Sample NUST NET-I Physics questions, Sample NUST Physics questions, sample NUST questions, Solved NUST MCQs, Solved NUST Past Paper, Where to prepare, Where to prepare for NET-I, Where to prepare for NUST, Where to prepare for NUST NET-I, Where to prepare for NUST NET-I entry test on November 23, 2018 by Pakprep.com Admin. 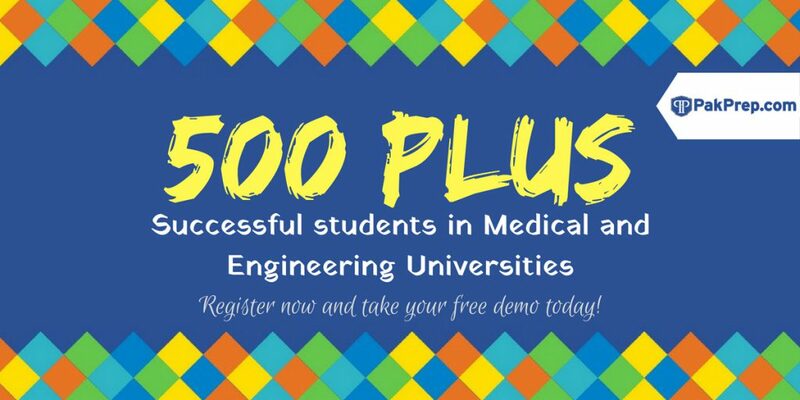 Pakprep.com is the best online entry test preparation portal for NUST NET or any other medical or engineering university. Pakprep.com contains all relevant material for the preparation of any entry test which includes more than 15000 solved MCQ”s, past papers, MOCK test and smart analytics. These all features of Pakprep.com give competitive edge to our students over all other applicants. To start your preparation today with Pakprep.com please CLICK HERE. This entry was posted in NUST and tagged Best way to prepare for NUST, Best website to prepare for NET-I, Best website to prepare for NUST, Best website to prepare for NUST NET-I, Download NUST NET Past Paper, Download NUST Past Papers, How much marks I need in NUST NET?, How to Calculate NUST Aggregate, How to prepare for NUST, How to Prepare for NUST NET 2016, How to Prepare for NUST NET 2017, How to prepare for NUST NET-I, How to prepare NUST NET, How to Register for NUST NET Test, How to register how nust net, Important Maths Topics for NUST NET, Important Physics Topics NUST NET, Marks Required in NUST NET?, Mechatronics Engineering eligibility criteria, NET, NET 1, NET 2, NET 3, NET-I explained MCQ’s, NET-I MCQ’s, NET-I MOCK test, NET-I past papers, NET-I solved MCQ’s, NUST, nust 2015, nust 2016, nust 2017, nust admission, nust admission 2017, NUST admission fee, NUST admission fee for international students, NUST admission fee for national students, Nust Admission Test, Nust Admission Test 2015, Nust Admission Test 2015 engineering, Nust Admission Test 2016, Nust Admission Test 2016 engineering, Nust Admission Test 2016 NUST NET 2016 Preparation, Nust Admission Test 2017, Nust Admission Test 2017 engineering, Nust Admission Test 2017 NUST NET 2017 Preparation, NUST Aerospace Engineering eligibility criteria, NUST Aggregate, NUST aggregate 2014, nust Aggregate 2016, nust Aggregate 2017, NUST Bachelor of Industrial Design program, NUST Bachelor of Military Art and Science program, NUST BBA program (Hons. ), NUST BE Aerospace program (Aviation Mechanical), NUST BE Avionics program (Aviation Electrical), NUST BE Chemical program, NUST BE Civil program, NUST BE Computer program, NUST BE Electrical program, NUST BE Environmental program, NUST BE Geo Informatics program, NUST BE Industrial and Manufacturing program, NUST BE Materials program, NUST BE Mechanical program, NUST BE Mechatronics program, NUST BE program (Telecom), NUST BE Software program, NUST Biology MCQs, NUST BS Accounting & Finance program, NUST BS Architecture program, NUST BS Computer Science program, NUST BS Economics program, NUST BS Mass Communication program, NUST BS Mathematics program, NUST BS Physics program, NUST BS Public Administration program, Nust Chemistry MCQs, NUST Civil Engineering eligibility criteria, NUST Computer Science (Islamabad) eligibility criteria, NUST Computer Software Engineering eligibility criteria, NUST Electrical (Telecom) eligibility criteria, NUST Electrical Engineering eligibility criteria, NUST Eligibility Criteria, nust engineering, NUST Engineering Past Paper, Nust Entrance Test, Nust Entrance Test 2015, Nust Entrance Test 2016, Nust Entrance Test 2017, nust entry test, NUST Entry test 2015 preparation, NUST Entry test 2016 preparation, NUST Entry test 2017 preparation, NUST entry test expected dates, NUST entry test expected dates 2018, nust entry test preparation, NUST Environmental Engineering eligibility criteria, NUST Expenses, NUST explained MCQ’s, NUST fee, NUST fee for international students, NUST fee for national students, NUST FEE Structure, nust financial aid, NUST Geo Informatics Engineering eligibility criteria, NUST Integration MCQs, Nust Islamabad, NUST Maths MCQs, nust mcqs, NUST Mechanical Engineering eligibility criteria, NUST Merit 2014, nust merit list, NUST merit list 2016, NUST MOCK test, NUST Mock Tests, nust net, NUST NET 1, NUST NET 1Paper Pattern, NUST NET 2, NUST NET 2017, NUST NET 2017 Format, NUST NET 2017 MCQs, NUST NET 2017 Physics MCQs, NUST NET 3, NUST NET 3 Preparation Online, NUST NET 3 Solution, NUST NET Biology MCQs, NUST NET Chemistry MCQs, NUST NET Maths MCQs, NUST NET Online Preparation, NUST NET Online Test Preparation, NUST NET Paper Pattern, NUST NET Past Papers, NUST NET Physics MCQs, NUST NET Practice Test, nust net preparation, NUST NET preparation 2016, NUST NET preparation 2017, NUST NET result, NUST NET-I, NUST NET-I eligibility criteria, NUST NET-I entry test, NUST NET-I expected dates, NUST NET-I explained MCQ’s, NUST NET-I MCQ’s, NUST NET-I MOCK test, NUST NET-I past papers, NUST NET-I solved MCQ’s, Nust past paper, NUST Past Papers, NUST Past Papers Engineering, NUST Past Papers Medical, nust physics, Nust Physics MCQs, Nust Practice MCQs, Nust practice test, nust programs, nust scholarships, NUST Semester FEE, NUST Software Engineering eligibility criteria, NUST Solved MCQs, Nust test, NUST tuition fee, NUST tuition fee for international students, nust undergraduate, nust undergraduate admission, nust undergraduate admissions, nust undergraduate program, nust undergraduate programs, NUST University, NUST yearly expenses, online NET-I preparation, online NUST NET-I preparation, online NUST preparation, Sample NET questions, Sample NET-I Chemistry questions, Sample NET-I Math questions, Sample NET-I Physics questions, Sample NUST Chemistry questions, Sample NUST Math questions, Sample NUST NET-I Chemistry questions, Sample NUST NET-I Math questions, Sample NUST NET-I Physics questions, Sample NUST Physics questions, sample NUST questions, Solved NUST MCQs, Solved NUST Past Paper, Where to prepare, Where to prepare for NET-I, Where to prepare for NUST, Where to prepare for NUST NET-I, Where to prepare for NUST NET-I entry test on November 23, 2018 by Pakprep.com Admin. NUST NET sample physics MCQ’s from Pakprep.com. NUST NET entry test is considered to be one of the toughest entry test in Pakistan. NUST NET registration is open from 18-Nov to 18-Dec, entry test will be conducted 28-Dec on wards. Every year thousand of students apply for NET but very little can secure their seats. NUST eligibility criteria is not very high and only 60% marks are required in FSc to become eligible. NUST mainly focus on their quality education and providing facilities to their students that’s why their fee structure is also bit high. To facilitate poor students they also provide need based scholarships. Pakprep.com is best online entry test preparation website. Pakprep.com is equipped with more than 15000 solved MCQ’s along with their explanations. Pakprep.com also provide engineering and computer science past papers to their students. MOCK test is also one of the main feature of Pakprep.com which are prepared according to NET criteria and also marked according to that. Smart analytics will help students to see their performance and identify their weak areas. To start your preparation today with Pakprep.com please CLICK HERE. This entry was posted in NUST and tagged Best way to prepare for NUST, Best website to prepare for NET-I, Best website to prepare for NUST, Best website to prepare for NUST NET-I, Download NUST NET Past Paper, Download NUST Past Papers, How much marks I need in NUST NET?, How to Calculate NUST Aggregate, How to prepare for NUST, How to Prepare for NUST NET 2016, How to Prepare for NUST NET 2017, How to prepare for NUST NET-I, How to prepare NUST NET, How to Register for NUST NET Test, How to register how nust net, Important Maths Topics for NUST NET, Important Physics Topics NUST NET, Marks Required in NUST NET?, Mechatronics Engineering eligibility criteria, NET, NET 1, NET 2, NET 3, NET-I explained MCQ’s, NET-I MCQ’s, NET-I MOCK test, NET-I past papers, NET-I solved MCQ’s, NUST, nust 2015, nust 2016, nust 2017, nust admission, nust admission 2017, NUST admission fee, NUST admission fee for international students, NUST admission fee for national students, Nust Admission Test, Nust Admission Test 2015, Nust Admission Test 2015 engineering, Nust Admission Test 2016, Nust Admission Test 2016 engineering, Nust Admission Test 2016 NUST NET 2016 Preparation, Nust Admission Test 2017, Nust Admission Test 2017 engineering, Nust Admission Test 2017 NUST NET 2017 Preparation, NUST Aerospace Engineering eligibility criteria, NUST Aggregate, NUST aggregate 2014, nust Aggregate 2016, nust Aggregate 2017, NUST Biology MCQs, Nust Chemistry MCQs, NUST Civil Engineering eligibility criteria, NUST Computer Science (Islamabad) eligibility criteria, NUST Computer Software Engineering eligibility criteria, NUST Electrical (Telecom) eligibility criteria, NUST Electrical Engineering eligibility criteria, NUST Eligibility Criteria, nust engineering, NUST Engineering Past Paper, Nust Entrance Test, Nust Entrance Test 2015, Nust Entrance Test 2016, Nust Entrance Test 2017, nust entry test, NUST Entry test 2015 preparation, NUST Entry test 2016 preparation, NUST Entry test 2017 preparation, NUST entry test expected dates, NUST entry test expected dates 2018, nust entry test preparation, NUST Environmental Engineering eligibility criteria, NUST Expenses, NUST explained MCQ’s, NUST fee, NUST fee for international students, NUST fee for national students, NUST FEE Structure, nust financial aid, NUST Geo Informatics Engineering eligibility criteria, NUST Integration MCQs, Nust Islamabad, NUST Maths MCQs, nust mcqs, NUST Mechanical Engineering eligibility criteria, NUST Merit 2014, nust merit list, NUST merit list 2016, NUST MOCK test, NUST Mock Tests, nust net, NUST NET 1, NUST NET 1Paper Pattern, NUST NET 2, NUST NET 2017, NUST NET 2017 Format, NUST NET 2017 MCQs, NUST NET 2017 Physics MCQs, NUST NET 3, NUST NET 3 Preparation Online, NUST NET 3 Solution, NUST NET Biology MCQs, NUST NET Chemistry MCQs, NUST NET Maths MCQs, NUST NET Online Preparation, NUST NET Online Test Preparation, NUST NET Paper Pattern, NUST NET Past Papers, NUST NET Physics MCQs, NUST NET Practice Test, nust net preparation, NUST NET preparation 2016, NUST NET preparation 2017, NUST NET result, NUST NET-I, NUST NET-I eligibility criteria, NUST NET-I entry test, NUST NET-I expected dates, NUST NET-I explained MCQ’s, NUST NET-I MCQ’s, NUST NET-I MOCK test, NUST NET-I past papers, NUST NET-I solved MCQ’s, Nust past paper, NUST Past Papers, NUST Past Papers Engineering, NUST Past Papers Medical, nust physics, Nust Physics MCQs, Nust Practice MCQs, Nust practice test, nust programs, nust scholarships, NUST Semester FEE, NUST Software Engineering eligibility criteria, NUST Solved MCQs, Nust test, NUST tuition fee, NUST tuition fee for international students, nust undergraduate, nust undergraduate admission, nust undergraduate admissions, nust undergraduate program, nust undergraduate programs, NUST University, NUST yearly expenses, online NET-I preparation, online NUST NET-I preparation, online NUST preparation, Sample NET questions, Sample NET-I Chemistry questions, Sample NET-I Math questions, Sample NET-I Physics questions, Sample NUST Chemistry questions, Sample NUST Math questions, Sample NUST NET-I Chemistry questions, Sample NUST NET-I Math questions, Sample NUST NET-I Physics questions, Sample NUST Physics questions, sample NUST questions, Solved NUST MCQs, Solved NUST Past Paper, Where to prepare, Where to prepare for NET-I, Where to prepare for NUST, Where to prepare for NUST NET-I, Where to prepare for NUST NET-I entry test on November 21, 2018 by Pakprep.com Admin.